While many insects, such as butterflies and dragonflies migrate to warmer temperatures in the winter, others tough it out in huddles with body heat sustaining them through the winter. Beetles, bees and ladybugs are examples of those who cluster together for the winter. The Bug Dude can provide the professional pest control in Fort Worth that require to take care of clustering insects that can make life miserable when spring arrives. Some spiders are capable of surviving the colder temperatures, while other insects are designed to freeze with the temperature – and survive. Mosquitoes and some other insects produce glycerol that acts as antifreeze enabling them to tolerate colder temperatures. On the other hand, crickets completely freeze in a process called torpor. Torpor is a state of suspended animation with their body completely shut down. Yet when the temperatures rise, they return to normal body processes. How they survive the complete freezing of their bodies is still a scientific mystery. If your home has a spider problem, give us a call to schedule pest control in Fort Worth. If you require professional pest control in Fort Worth for a mosquito problem or other pests, contact The Bug Dude today to schedule professional pest control services. We serve Fort Worth and the surrounding areas. The admirable strength of spider silk is often compared to steel, and can possess as much as six times the strength of steel per its weight. Spiders spin a variety of structures, but perhaps the most amazing is the Cyclosa who spins a web that’s an exact replica of itself, acting as a decoy to predators. To date, scientists have been unable to replicate spider silk in the lab, leaving it yet another scientific mystery. The tale of the Ampulex dementor wasp and the cockroach is a true horror story. A native to Thailand, the dementor wasp preys on cockroaches by injecting them with a venom that literally takes away their free will. 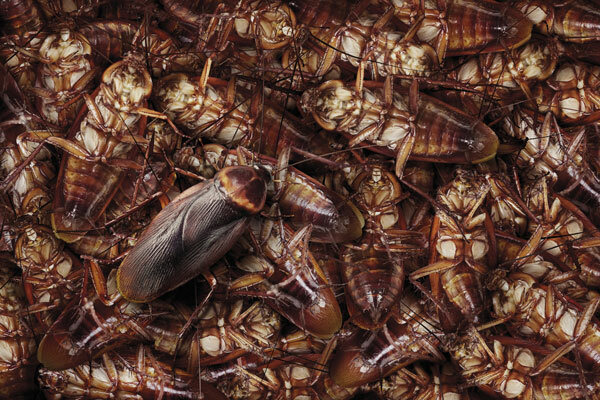 The venom which is injected into a cockroach’s belly blocks a neurotransmitter called octopamine that initiates the roaches mobility. With this receptor blocked, the cockroach is able to move, but cannot direct itself in any specific. It becomes zombie like, capable of movement, but lacking instincts and direction. Once the cockroach is incapacitated the dementor wasp drags the cockroach to a safe place to eat it alive. Wasps’ offer many benefits, and are useful to farmers by eating crop destroying pests such as weevils, grubs and caterpillars. 1.According to the latest research the essential oil contained in catnip may be more effective than DEET in repelling insects. Continue to use your DEET, but planting catnip around your home may deter mosquitoes and other insects. However, it will undoubtedly attract your cats to enjoy the outdoors. 2. Citronella grass is recognized as a mosquito repellent, and is commonly used in candles, torch oil and mosquito coils. Its strong odor overshadows the scent of other plants that mosquitoes are attracted to and helps keep them away from plants that attract rather than repel. 3. Lavender is a beautiful plant with a lovely scent. Lavender is well known and used for teas, candles, soaps, lotions and many other products. While it’s pleasing to humans, mosquitoes are repelled by the lavender oil inside the plant. 4. Marigolds are popular flowers for gardens and flower beds near the home. They repel a number of insects, including mosquitoes! The dainty marigold contains Pyrethrum, a substance which insects scramble to avoid. 5. Peppermint helps to repel insects such as mosquitoes, and is often used to rub on fresh insect bites to provide relief. 6. Basil, rosemary and lemon thyme helsp to repel insects, and offers the added bonus of being used in cooking. •Wear DEET on exposed skin when outdoors. • Eliminate standing water where mosquitoes may breed. They only need a small amount of water to live and reproduce. • Adult mosquitoes are attracted to uncut grass, unkempt lots, thick shrubs and trees. Maintaining a neat, trimmed lawn and thinning and pruning shrubs will assist in managing mosquitoes. Contact The Bug Dude to schedule pest control in Fort Worth. Maintaining a neat, clean lawn free of standing water and scheduling professional pest control in Fort Worth will enable you to control mosquitoes in your outdoor space. Contact The Bug Dude today to schedule effective pest control in Fort Worth. We serve Fort Worth and the surrounding areas.